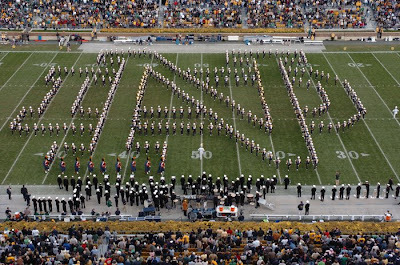 Lady Suzanne, Amy, Lucy, and I just returned from South Bend, Indiana where we witnessed the Fighting Irish do something we've always wished to see -- win! Notre Dame beat Stanford 28 to 21. We also witnessed something I'm guessing most people haven't seen: After the game, a gentleman ran down to where we were sitting just a few rows from the field and hurled a bag of "something" down on the field. The bag hit a band member and exploded in a cloud of dust. The "dust" was, well, actually dust -- the dust of the guy's dead brother. Seems that his brother's last wish was to have his ashes spread over ND's field. ND officials would not grant the request, so the guy had to improvise. I'm sure that the band members didn't know what hit them as they were dusting themselves off, but they were "instrumental" in helping a guy's final wish come true. Reminds me of the Kansas song, "All we are is dust in the wind." In this case, after the Fighting Irish dusted off Stanford, A dead man's brother dusted off the band! I like the phrase of them being "instrumental" in helping the guy's final wish come true. I hope it didn't hit the drum majors in their plaid wraps because, as Steve Martin let us know, "Dead Men Wear No Plaid"! Nothing like going out as a winner!